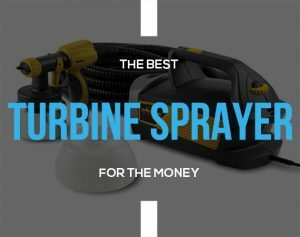 HVLP Turbine paint sprayers have become incredibly popular of late and this owing mainly to all the DIY enthusiasts and the weekend warriors out there who like to get their jobs done all by themselves. Painting your doors and furniture can be fun and many also regard this as a favorite pastime. However, painting with a brush or even rollers take time and the jet set age we are living in, time is never plentiful, to say the least! This is the reason why paint sprayers have been able to find such favor with DIY-ers. With paint sprayers, you can get the job done way faster than other methods. That said, the difficulty arises when it comes to choosing a particular sprayer. Budget is a factor but we also need to consider the performance of particular models and with so many products out there in the market (and often with mixed reviews), it is never easy to zero in on a product which will match all your different requirements and criteria. 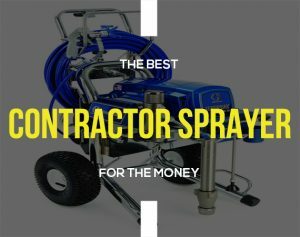 Keeping that in mind, we have in this article carefully selected/curated five turbine HVLP paint sprayers from different price ranges but which also cater to different needs and requirements. The purpose of this review list is to help you choose pretty much the best product at your selected budget and which will also be able to best meet your requirements. 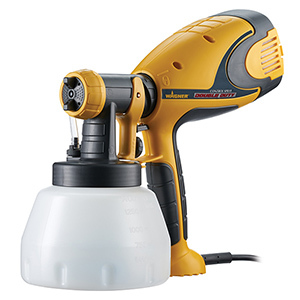 This HVLP paint sprayer with adjustable air pressure and variable flow control packs a lot of features that amateur painters and DIY-ers will find useful. 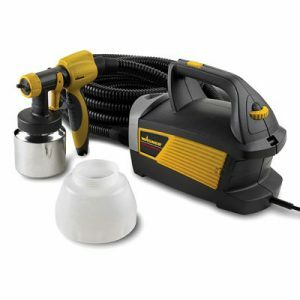 The sprayer is ideal for small to medium sized painting projects such as painting furniture, staining decks, painting windows and door trims, etc. and one can use a variety of painting and staining material with this sprayer including latex. However, there is a viscosity measure and thinning is advisable for materials which are too thick. Large air filters that help achieve a smooth finish by preventing dust and other particles that may mar the finish on the paint surface. 20-foot long air hose that allows for greater mobility during a project. The unit is somewhat noisy. Some users report spluttering issues after a period of use. Q. Can I use lacquer with it? A. Yes, unlike many products in this category, you can actually use a flammable item such as lacquer with it without any risk of accident or injury. Q. Do I need an air compressor for this? A. No, this is a turbine driven unit. All you need is to plug the unit at an electric point. Q. Can I attach a tip extension with this unit? A. No, the unit does not support tip extension as it is not meant for painting ceilings, etc. For homeowners who like to finish their home paint projects all by themselves, this unit is a perfect one and is one of the best you are likely to find in this price category. Users report having experienced very little overspray with this model (a common problem with consumer grade paint sprayers), so it does seem that the ‘Control Spray’ title of the model is well earned! 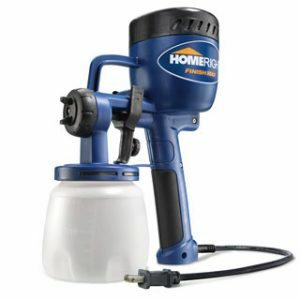 In addition, features like variable spray pattern, air pressure control, air filters, two containers (one metal and another large 1 ½ quart plastic) and the large air hose make this model a highly desirable one in its class. As the title makes clear, this is a semi-professional model which comes with a lot of high end features that you do not get (and cannot realistically expect!) in consumer grade models. 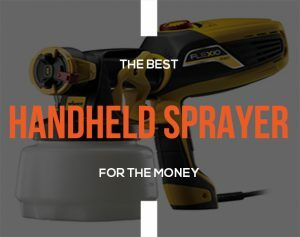 Among other things, the model includes a sturdy metal turbine case with a gun holder; a 25-foot long hose equipped with an air control valve which prevents bounce back and minimizes overspray; a convertible M-Model spray gun which allows the gun to switch from a bottom feed to a gravity feed one; a dedicated fan control; a professional build stainless steel fluid passage and more. Quick and easy set-up as well as easy disassembly (which makes maintenance and clean-up a breeze). Multiple air cap sizes allowing a high degree of versatility both in terms of paint patterns as well as painting materials with different viscosity levels. Ergonomic paint handle that stays cool while painting. Fast delivery means it is difficult to control overspray during a job. Most DIY-ers may consider the price a steep one. Without careful maintenance, the metal parts, though meant to ensure a high durability, can be vulnerable to corrosion. Q. How much does the unit weigh? Q. If I want to spray plasti-dip or latex, do I need to get additional set of caps? A. You can use both with the 1.3 mm cap of the unit but you will need to thin the paints down. If you want to use plasti-dip or latex without dilution, it is best to use a 1.8 mm air cap set which, however, you will need to buy separately. Q. Can I paint my interior walls with this unit? A. Yes. However, it is recommended that you use a full professional grade airless/air-driven sprayer for large interior jobs. Otherwise, you run the risk of wearing out the hose as well as the turbine before time. For a semi-professional unit meant for small shop operations as well as for weekend jobs by serious hobbyists, there is little scope to find faults with this machine. The fast delivery means that you cannot control the overspray as much as you will like to, however this happens to be a common problem with powerful turbine HVLP sprayers and as long as you take special care to wrap and protect the places you don’t want to get the paints in, you’ll be fine. Apart from that, the model is a high quality one and, with proper maintenance, will last you for years. To cap off, highly recommended as long as the relatively high price is not an issue. Suitable with a wide range of painting materials of low to high viscosity, this professional grade non-bleed HVLP paint sprayer packs a lot of quality features and will be highly appreciated by both professional painters as well as serious hobbyists. 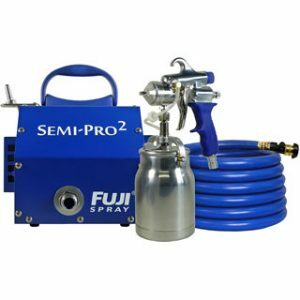 For a professional grade unit that produces minimal overspray, the model is also quite easy to transport—something that professional paint workers will especially value. The model comes with all the features included in the Fuji Semi-Pro unit reviewed above but what really sets it apart from the other model (hence the difference in price) is the powerful 4-stage turbine as well as the powerful motor that are included in this unit. Powerful 4-stage turbine able to handle both small and large projects. 2-year warranty on labor & parts. Overspray is experienced when working with too thick materials. The noise reduction covers do not work as well as advertised and the high noise is common when tackling heavier projects. Q. Does the model come with an air cap set? Or will I need to buy one separately? A. It comes with the standard 1.33 mm air cap set which would be adequate for handling most jobs that you can perform with this unit. However, for some large scale projects, especially those which require use of high viscosity materials, you may need to purchase an additional set. Q. How noisy it actually is? A. Considering this is a pro model which is equipped to handle heavier jobs, the unit is somewhat noisy. That said, the noise is pretty much what you get with standard vacuum cleaners. If the noise proves bothersome to you, you can always use a set of good ear plugs. At $800, the model may not be the perfect one for homeowners or do-it-yourselfers. The model is primarily considered by professionals who include it as one in their set of different models for use at different projects. However, you can consider it even if you are not a professional. You get premium quality finish with this model; it will last you for years; and the little overspray means you get to save a lot on the painting costs since little paint goes waste. Add to that the convenience provided by its multiple features and it should appear as a worthy enough investment. The durability of the unit also ensures decent resale value. This model stands out for the very fact that it supports auto painting (which very few models in this price range will do). In fact, one often finds homeowners asking if a consumer or budget category paint sprayer will be fit for automotive painting and more often than not, the answer is a NO. So, this Wagner MotoCoat model will come as a welcome change for such consumers. At the same time, you can finish many small to medium sized furniture, cabinetry, decking, fencing, garage doors and other jobs with this model. Two different nozzles and cup attachment—iSpray nozzle and Detail Finish nozzle for fine and textured finish with thicker and thinner materials respectively. Easily separable spray attachments that facilitates quick clean-up as well as color changes during a job as and when required. The container is somewhat small for a truck (or even a) car paint job. Tends to be noisy at times. Clogging can be a common issue without regular and through cleaning. Q. 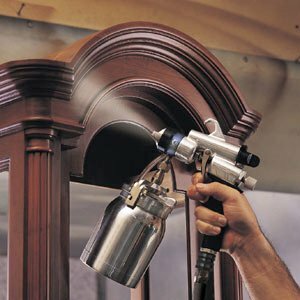 Can I use plasti dip with this sprayer? A. Yes, the sprayer is compatible with plasti dip paint. Q. Is it possible to use metal and pearl flake paint with this sprayer and still get a professional finish? A. Yes, you can use flake paints with the sprayer. However, it is recommended that you carefully read the instructions given in the user manual on how to use these types of paint with this sprayer. Also, it is advisable that you first try it a little on a cardboard just so that you get the air pressure and flow control settings right when you will actually be using the paint on your car. This Wagner auto paint model makes car and truck painting more affordable than ever. Not only does the model provide professional quality finish, it also makes sure that even beginners can use it without any difficulty at all. The different nozzles provide for fine finish with different materials used at different body parts of a truck or car. It may also help you to know that the X-Boost Turbine used in this model packs up to 3 times more power than other turbine sprayers in its price and weight class. Overall, a highly recommended product. When it comes to a turbine sprayer which is highly affordable and is ideal for beginners looking to finish smaller size projects, the HomeRight FinishMax would rate right on top. It is ultra lightweight, comes with a decently powerful motor, a capacity container and is able to handle a variety of coating materials including milk paint, primers, enamel, chalk type paints, latex paints and more (though some of these may require different degrees of thinning). Easy to use and easy clean-up features. Ideal for beginners. Clogging and paint leaking out of the side of the spray gun can happen after a period of use. Q. How am I to clean the needle (since I am not able to detach it)? A. You don’t need to remove the needle itself. Just make sure that your cleaning agent runs through it when you are cleaning the unit. Q. Does the product come with a viscosity cup? A. yes, it does and the viscosity cup is very helpful for jobs where you need to thin down/dilute your painting agent. Since the products we have reviewed here represent vastly different price categories and competitor classes (and are also meant to suit different requirements), we will refrain from naming any one or two as our favorite. We have listed three products which fall in the consumer grade—the Finish Max and the two Wagner products. As for the Wagner car paint model, this, irrespective of the price, falls in a different category of itself. 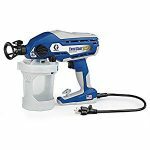 There aren’t many HVLP sprayers which are suitable for auto paint and certainly, very few in the price category the present model comes in (the model is currently priced at $165 at Amazon). So, since the product delivers good performance, we highly recommend it to anyone who wants to paint his car/truck all by himself. As for the other two, it may help you to know that FinishMax happens to be the bestselling paint sprayer at Amazon. This is little surprise considering it delivers high quality performance at a mere $65! However, if you are not on a tight budget, you may as well go for the Wagner Control Spray model. This model is ideal for beginners who understandably are somewhat nervous since they have little experience of working with a spray gun. Since the model sprays paint in a very controlled manner and with little to no overspray, the beginners will enjoy the stress-free experience of working with it. As for the Fuzi models, the Semi-Pro model is a premium quality product and will always be the better option if you can afford the relatively high price (around $425) of the product. 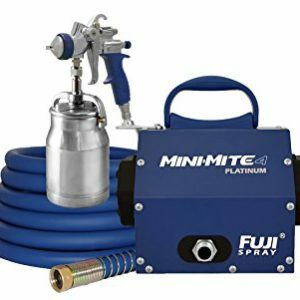 Finally, the Fuzi Mini-Mite (at $799) is a model we would only recommend for professionals or for those who have plans to turn professional in the near future with their spray painting skills.